Do you love the smell of warm, buttery popcorn? Pop the perfect salty batch for your guests to much on during your party. This is for machine only. 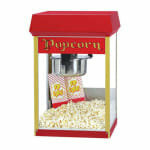 Easy to use popcorn kits are sold on the concessions page.